Tiara Yachts, created in 1976, is part of the still family owned S2 Yachts that has its roots when Leon Slikkers first started building runabouts in Holland, Michigan under the SlickCraft name in 1955 after he left Chris Craft. Pursuit Boats of Fort Pierce, Florida, created in 1977, is part of the same family and originated in Holland, Michigan in the S2 Yachts’ Tiara facility. The Tiara 31 is presented as a “day yacht,” or perhaps in our Canadian nomenclature as a “weekender” as it offers comfortable overnighting/weekending in the cabin for two plus great day cruising/entertainment in the cockpit for many. The exterior profile exudes the timeless classic lines and recognized sheer of larger yachts while the interior is contemporary modern, elegant, and plush. Its wide 12-foot, 6-inch beam offers uncluttered cockpit space with ample and flexible seating options and elbow room for as many persons as you would ever want to entertain and cruise with. A standard and extra large 40-inch deep swim platform with built-in ladder leads through a molded-in centreline transom door to the cockpit. L-shaped lounge seating extends from this opening and along each transom portion up each cockpit side to the molded-in side cockpit access steps finished with teak step treads. A port and starboard aft-facing comfortable single or cozy double seat faces each of the L-shaped lounges. A standard solid polished folding leaf teak table serves this cockpit seating area and converts into a sunpad with the filler cushion provided. Finished storage is provided within all of the seating. A hot and cold cockpit shower is standard as are weather covers for the cockpit seating and helm console. A double-wide helm seat with storage below is opposite the port side L-shaped curved passenger lounge, again with storage below and provided with another polished teak table and teak step treads. Immediately aft of the helm seat is a standard molded entertainment center with sink, 2.6 cu. ft. stainless steel drawer refrigerator, plus an electric grill. The hinged and fully tilting helm console of the Tiara 31 affords ready aft-side access for maintenance. A high windshield with dual pantographic wipers with washers and with custom composite frame is molded directly to the standard hardtop equipped with sun roof and side enclosures. A center windshield powered opening vent is standard. A large powered center cockpit hatch provides engine room access with built-in ladder. A centerline screened acrylic sliding cabin door leads three teak stairs down to the sumptuous accommodations below featuring architectural teak interior wood and Amtico® dark walnut flooring. The forward convertible V-berth offers foam mattresses with choice of fabric colours and throw pillows plus another highly polished solid teak hi-lo table with filler cushion. The portside head compartment with wet shower offers standard Corian® countertop vanity with storage, stainless steel sink, Vacuflush® toilet, plus an air conditioning/heating vent. The starboard side L-shaped Corian®-topped galley with stainless sink includes a microwave oven and refrigerator. Cabin air conditioning/heating is standard as is a cedar-lined hanging locker, storage, plus a Fusion® multi-zone stereo with amplifier, cockpit remote, and seven speakers. 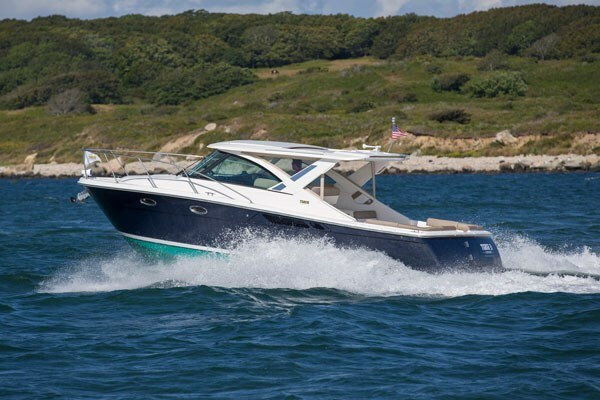 Your choice of twin straight inboard 325 hp Crusader® 6.0L gas or 330 hp Volvo® D6 diesels power the Tiara 31 for cruising at about 30 mph and a top speed of about 40 mph. Additional standard equipment includes trim tabs, anchor windlass with anchor and chain, dockside power and water, battery charger, gas or diesel instrumentation, and an engine room automatic fire extinguishing system. For options, you may choose DuPont® hull colours, an Onan® diesel generator, bow thruster, cockpit carpet or Sisal Seagrass™ or Taupe Grass Cloth™, fresh and/or raw water cockpit washdown, cockpit canvas enclosure curtains, Makefast® aft cockpit electric sunshade, solid teak and holly cabin sole, exterior teak accent package including swim platform inlay, plus a selection of Garmin® electronics including autopilot and remote spotlight.